Zazen meditation is difficult. However, practising it on a daily basis is very effective for the expansion of consciousness and the development of intuition. Zazen not only releases great energies, but it is also and especially the attitude of revival. By practicing zazen, our brain can regain its normal and original state and returns to the cosmic order. Sitting in zazen, you let the images, the thoughts and all the mental structures that emerge from the unconscious pass by like clouds in the sky - without resisting them, without clinging to them. Like shadows in front of a mirror, everything that emanates from the subconscious passes by, returns back and finally disintegrates. Thus one reaches the deep unconscious, which is without thought, beyond all thinking, true purity. Zen education is strong and is aimed at people who are already strong. Zen is very simple and at the same time quite difficult to understand. It is a matter of effort and repetition - like life. If you sit - unceremoniously, without purpose and profit - your posture, breathing and mental attitude in harmony, then you understand the true Zen. Every day you practise, your mind changes. Human wisdom alone is not enough, it is not complete. Only universal truth can provide the highest wisdom. Take away the word Zen and put Truth or Order of the Universe in its place. Zazen is like water in a glass. Leave the water to sit quietly and soon the dirt will sink down, down, and the water will become pure. Zen is not a particular state but the normal state: silent, peaceful, unagitated. You cannot separate any part from the whole: interdependence rules the cosmic order. What is called zazen is sitting on a zafu [pillow] in a quiet room, absolutely still, in the exact and proper position and without uttering a word, the mind empty of any thought, good or wicked. It is continuing to sit peacefully, facing a wall, and nothing more. Every day. You have to practice until you die. Taisen Deshimaru (1914-1982) grew up on the island of Kyushu in Japan. He was a disciple of Kodo Sawaki, who was one of the most influential Zen masters of the 20th century in Japan: He insisted on the importance of the practice of zazen and made the practice accessible to lay people. Shortly before his death, Kodo Sawaki ordained Taisen Deshimaru as a monk and asked him to pass on the living Zen to the West. 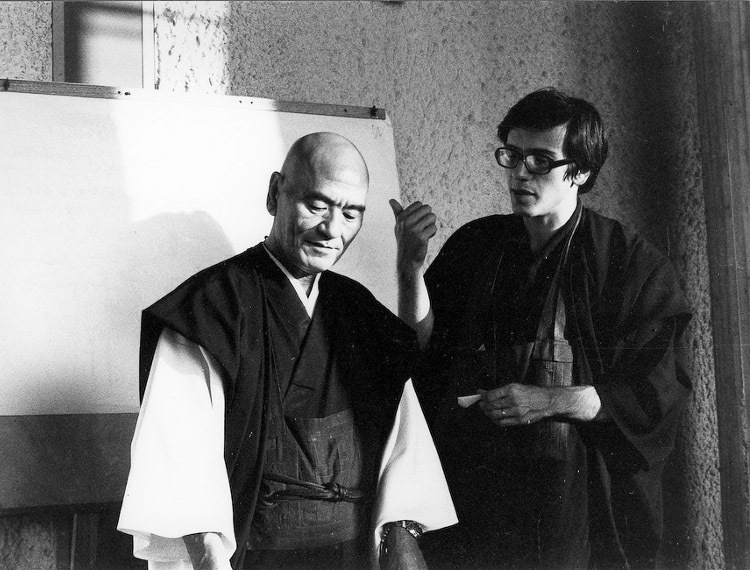 Taisen Deshimaru brought the essence of Zen to Europe in its original freshness. In Europe he found the ideal environment to spread a Zen which is rooted in everydays life. It was his great concern to contribute to the crisis of our civilization by spreading the practice of Zen. He had a deep desire to help today's people and to lead them through zazen to a deeper understanding of themselves and their lives, whose imbalance he felt deeply.